If you have a manufacturing plant, factory, storage facility, warehouse or industrial building that needs an interior or exterior overhaul or restoration, you need to contact a specialized painting company. Induspray is a painting contractor offering industrial painting services throughout the Troy, Michigan area, and as a crew of skilled painters, we are expert at what we do. 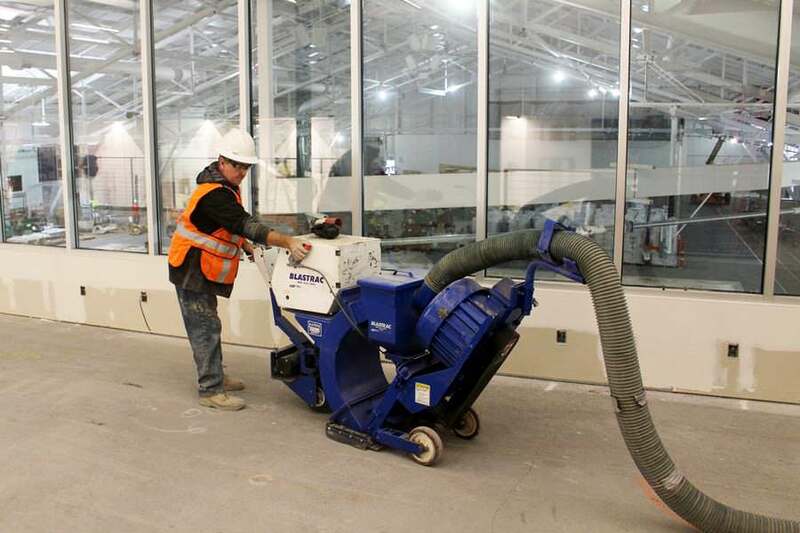 Induspray has a complete team that can work safely and take on larger tasks confidently. Regardless of whether the facility needs repainting or coating on the exterior or interior, Induspray can easily handle it. 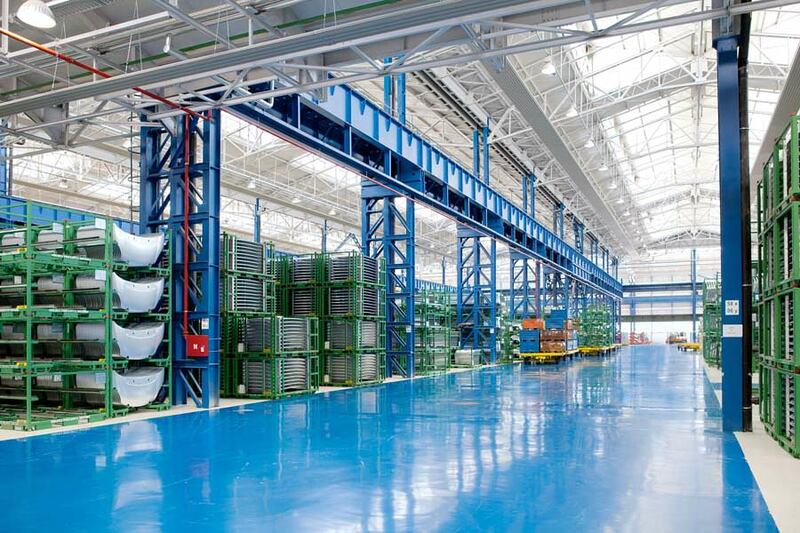 We focus on preparing industrial buildings, plus old and contaminated facilities for painting. We also specialize in the high-volume spray painting of corrugated galvanized metal deck ceilings. What makes a paint job outstanding is the prep that’s been done on the underlying surface. If the surface is dirty or flimsy, the job will almost surely end up as a failed mess. We find that there are effective methods to clean surfaces and provide an ideal area for coatings and paints to properly cover and adhere to. A failed paint job usually results in additional expenses that would go beyond a project budget, which is why we provide a quality job the first time. Induspray is an industrial painting contractor company that believes in making sure the surface preparation is completed correctly. We use different techniques depending upon the specific need. Steam cleaning, pressure washing, sand blasting, dry-ice blasting, chemical cleaning, and other techniques are commonly used to clean surfaces by our professional painters. Our team of expert painters are knowledgeable in what types of techniques should be used to apply paint or coating. This includes airless spray painting, something we specialize in. Every situation is carefully analyzed in order to choose the correct and most effective method for painting or coating a surface properly. 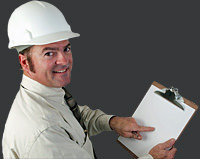 Our painting contractor crew works throughout Troy and Michigan in numerous industrial type scenarios. We have the capability to handle painting jobs that include hard-to-reach spaces inside a building or even exterior painting that has high areas. 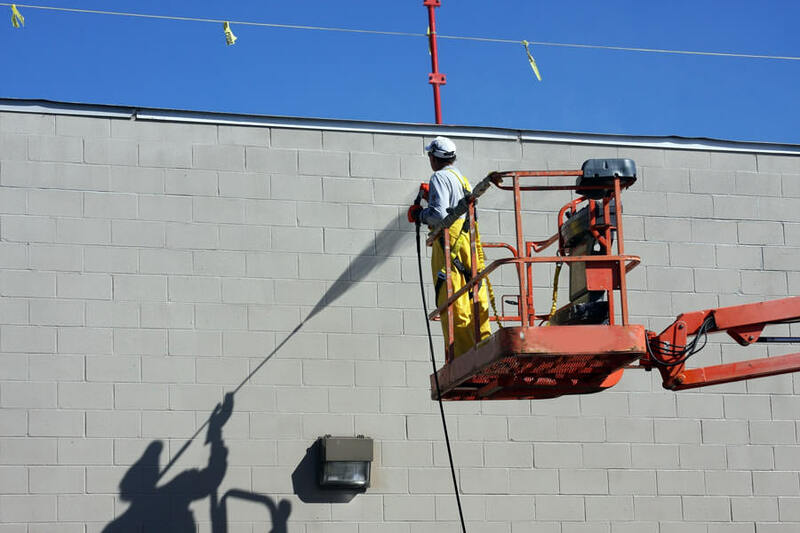 Utilizing aerial lifts safely, the Induspray painters can reach any surface to ensure it is properly painted/coated. 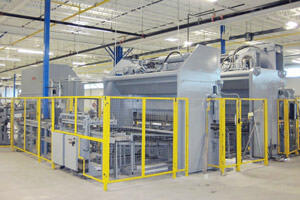 Induspray utilizes a wide variety of coatings and paints, and each is top-notch. We focus on the exact application process, how long each product would last on a particular surface, and the overall cost for the customer. 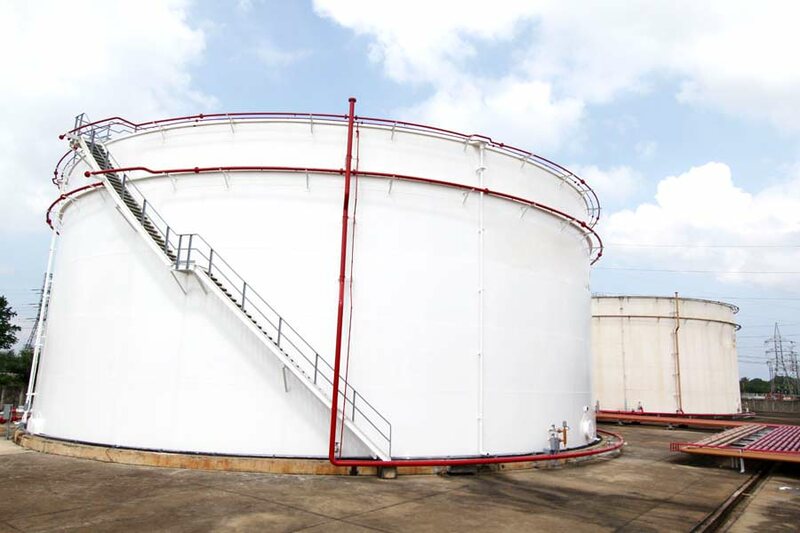 While each situation is unique, we commonly use oil-based or latex paints, rust-covering coatings, enamels, polyurethanes, urethanes, high-adhesive coatings, epoxies, low-emissions (low VOC coatings), no-slip coatings, and others depending upon the situation. 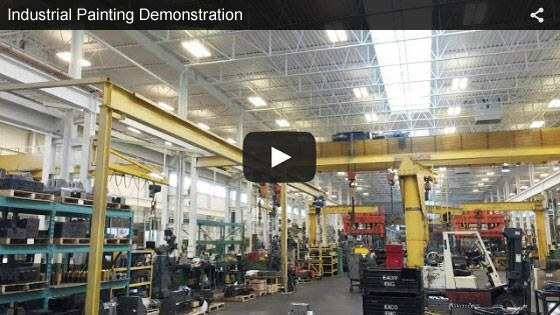 We always first conduct an analysis to make sure that the paint product or coating will match the needs for extended performance as well as being budget-friendly. For extreme weather, we make sure to take proper care during exterior painting or coating projects, both when conducting a job and choosing materials, to suit the highly variable climate in the Troy, MI area. 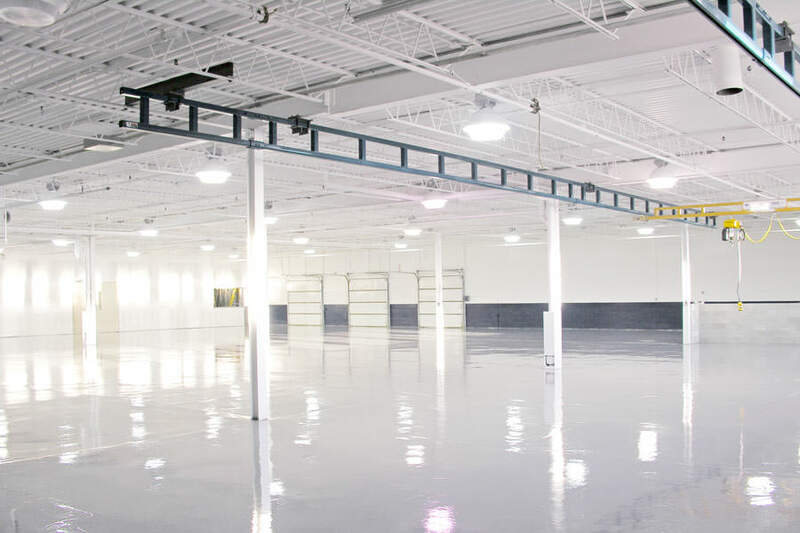 As an ideal choice for industrial and commercial painting projects in Troy, Michigan, Induspray has been in business and serving the area since 1975. 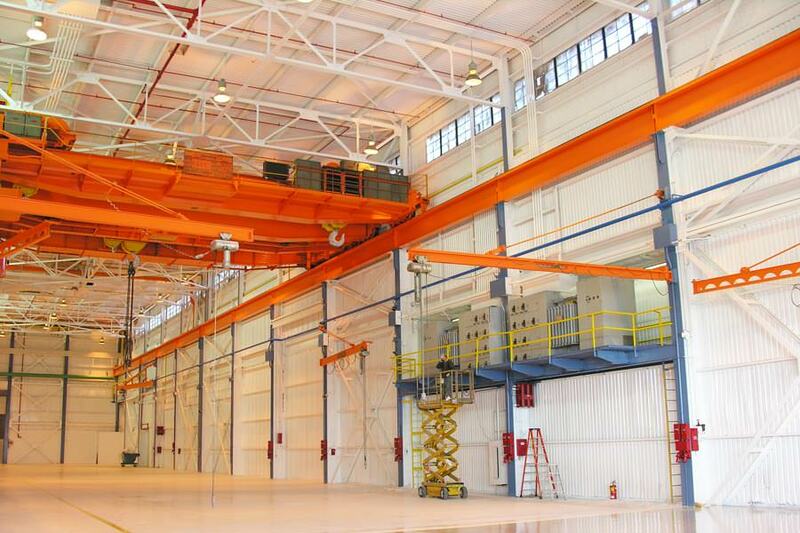 Over those years, we have accumulated extensive experience in various industrial painting scenarios through numerous projects, giving our painting crews the know-how of what to do and how to do it right. Through the use of effective managers who oversee the projects, our skilled painters, and a tight network of suppliers and industry partners, we make sure that each project is successfully completed on time. With the large volume of work that we do while refinishing millions of square feet with paint and coatings annually, our costs end up being significantly lower than those of our competition. That’s because we buy extremely large quantities of supplies, and can secure the lowest possible wholesale pricing with suppliers. 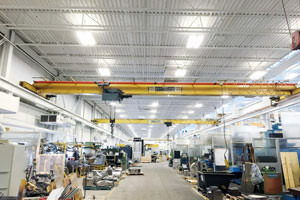 This is good for our customers, since we pass most of these savings on to them, resulting in lower total project costs. When you’re searching for someone in the Troy, MI area to do a painting project, and comparing the costs and evaluating your options, please include Induspray. One of our reps will happily answer any questions regarding your project requirements and can also visit your job site in person. From there, we’re able to make an educated cost estimate, and provide you with sound recommendations to designed best meet your project specifics. These service are completely free. Our local Troy, MI service area includes Troy itself plus Rochester Hills, Pontiac, Sterling Heights, Bloomfield Township and Birmingham located nearby in Oakland County, Michigan. "Andy and his two painting crews did an excellent job for us and performed in a professional manner. My staff and I thoroughly enjoyed working with all of them, and especially appreciated the excellent advice we were given pertaining to the choice of paint. The cost difference versus the options presented by other painting companies were dramatic, resulting in appreciable savings and kept us within our allotted refurb project budget. We couldn't be more satisfied." "Very professional, timely and polite. Additionally, we are very happy with the extra care given to cleaning and preparation, and it really shows in the end results. The new paint job makes such a big difference in the overall appearance of both the warehouse and main building. Thank you, it was well worth it." Troy, MI is located just north of Detroit in southeastern Michigan. A fairly industrial area, it has a population of approximately 82,000 and includes a range of businesses, industries and manufacturers. 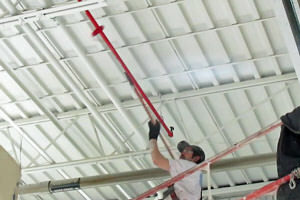 The area is served by several industrial painting services.